All Agile methods are guided by the Agile Manifesto and the Agile Principles. The Agile Manifesto takes 8 aspects of software development and compares the focus they should receive. A way to check if the Agile spirit is present is to bring a development team, management and stakeholders together. 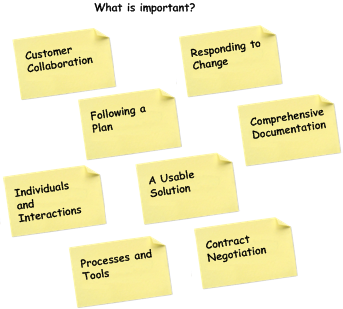 Write these 8 aspects on sticky notes as shown in Figure 5 and randomly put them on a flip-over or whiteboard. Then have every participant divide 5 marks over these aspects, reflecting his personal sense of value of these aspects in reaching the project goal (a happy customer). You can try this exercise for yourself. Which 5 aspects have you marked? The people all look tired and skinny. The houses are decaying and the farmland looks bare although there are crops growing on it. There seems to be a lot of poverty in this curious place.